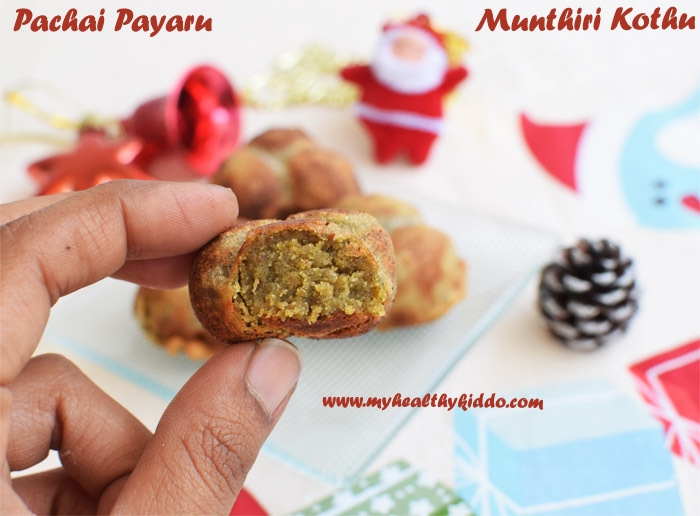 Munthiri kothu is a traditional south Indian sweet made using green gram(pachai payaru) as the main ingredient. Though cashew(Munthiri) is not used in this recipe, as this sweet is fried in bunch(kothu), it might be named so! 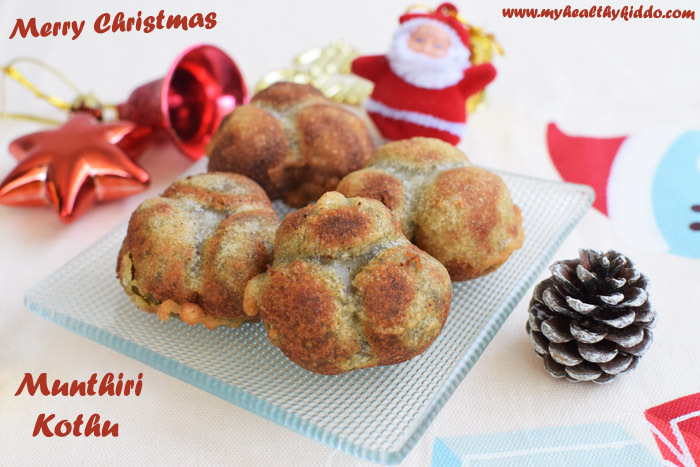 This is mainly made during Indian Christmas celebrations. But it is equally a popular evening snack in villages too. In my MIL‘s village, they do cultivate green gram and so they make enormous green gram dishes and this is one among them. Even their casual munch have a healthy touch! 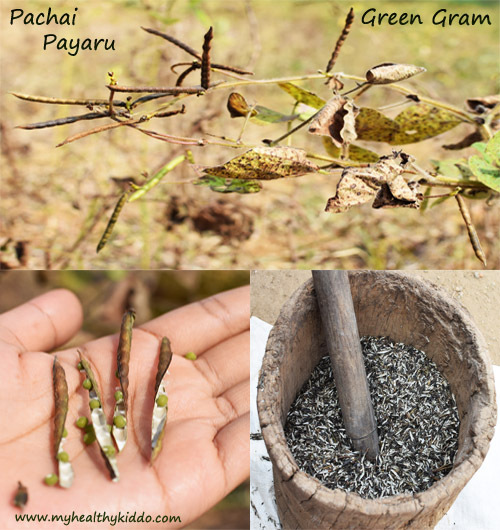 Below are the clicks of green grams in our field. Once the outer skin is dried, they are plucked from the plant and hit hard(as per last thumbnail in below pic) to skin-out the grams. Then they phew away the skin to collect the green grams. We need fertile lands to reap such healthy harvests. In recent years, fertile lands are being converted to plots. To let Agriculture survive and hence make future life possible in Earth, we have the responsibility to stop occupying fertile lands. When the buyer refuses, there won’t be any seller! Why don’t we re-think and verify before buying any land for construction ?? 1.Wash green gram and spread in a clean kitchen towel and let it dry under fan for half an hour. Then, fry in low flame until it is slightly browned. Green color should still be there, do not fully brown it. Then let it cool down. 2.Add jaggery, water and a generous pinch of cardamom powder. Let it boil until jaggery is completely dissolved and the syrup just bubbles up. Filter and keep ready. 3.Grind fried green gram in mixie. It should be finer than rava. In a pan, heat a spoonful of ghee. 4.Fry grated coconut in low flame till it is slightly browned. Then add green gram powder. 5.Fry for a minute and then add the jaggery syrup. Keep stirring until it slightly thickens. Once done, switch off the flame. 6.Once cooled, shape into small laddoos and join 3 laddoos as a bunch. Repeat until the stuffing is over. 7.Add water to rice flour. It should neither be too thick nor too watery. Dip each bunch in the batter. 8.Gently drop into hot oil and cook in medium flame. Turn to the other side too. Once sizzling sound reduces, take out and drain in tissue paper. Once cooled, store in air-tight container and grab whenever tempted! You shall avoid bunches and make single ball too. 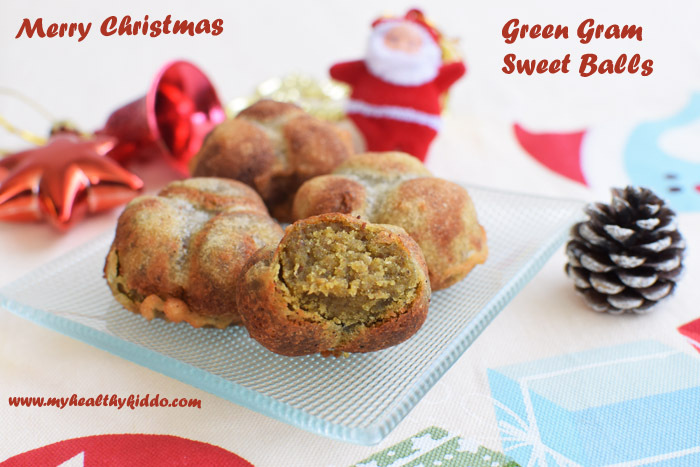 If you brown green gram much while frying, the taste of the stuffing will differ and this will have a strong flavor. So, avoid over-browning. Fry coconut well to increase the shelf life. You shall add dry-roasted sesame seeds(Ellu) before adding jaggery to the stuffing. I used homemade rice flour. You shall use store-bought too. Rice flour batter might thicken over time. Add water, whenever required.